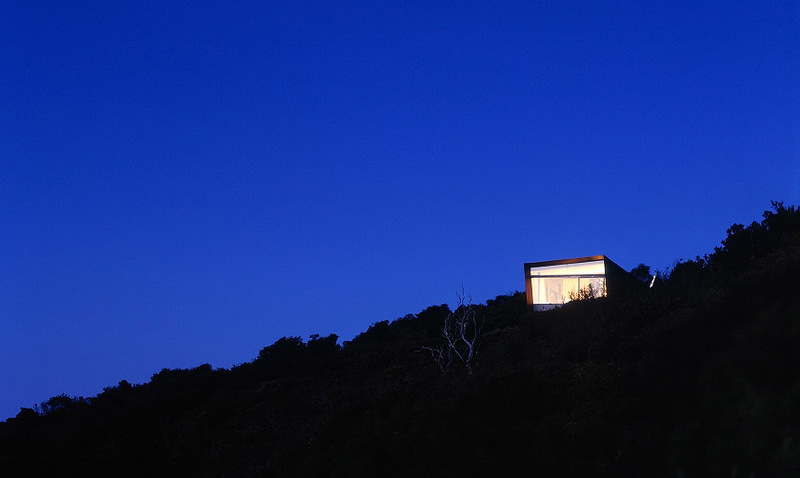 A holiday house for graphic designer, Gary Emery, by established Melbourne architecture practice, Denton Corker Marshall. Located in Cape Schanck on the Mornington Peninsula, the house was completed almost fifteen years ago yet boasts a timelessness that has preserved its elegance across a decade and a half of shifts in fashion and taste. The house was the subject of an informal discussion at Walsh Street House last week, courtesy of the Robin Boyd Foundation. Using the same format as the recent Our Houses presentation of Castlecrag House, both architect and client discussed the projects design, its use and their memories of its construction. Emery House is immaculately detailed, a carefully-crafted jewel. Denton noted during the discussion that despite its small size, a hefty 69 A1 drawings were produced to document it for construction. There is not a single element out of place; each wall, window, joinery item and light fitting was considered, worked over and considered again. The columns are particularly illustrative of this: cruciform in cross section, they liberate the west-facing side wall from structural responsibilities, permitting a cinematic ribbon of glass looking out over the tee-tree. Their protruding flanges also conceal the gap between blinds that descend from impossibly sharp cuts in the ceiling. The cruciform shape gives another, telling clue into the design process embodied in the house. 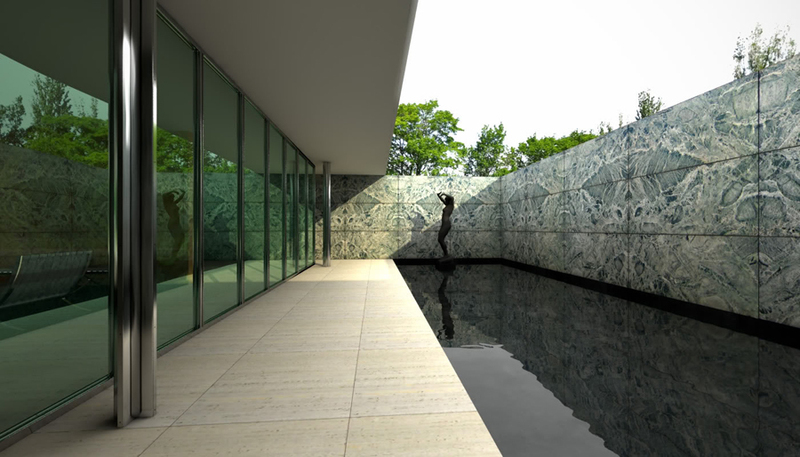 Ludwig Mies van der Rohe, the godfather of minimal modernism, used them extensively, most famously in his Barcelona Pavilion. The columns in Emery House may not be finished in polished chrome, instead made from galvanised steel (perhaps a subtle nod to Australian architectural culture), however their inclusion cannily signposts DCM’s occasional practice of selective architecture, an approach to design first mastered by Mies. To explain: architecture is charged with engaging a wide range of design issues – environment, history, structure, urban planning, context and industry to name a few. Often, a project attempts to reach across all issues, but falls short of the mark. Ludwig Mies van der Rohe was celebrated for ignoring some in order to brilliantly address those that remained. Farnsworth House for instance may have terrible thermal performance, but remains a stunning example of fine architectural sculpture. With Emery House, DCM have similarly crafted a beautiful piece of architectural sculpture, a refined series of living spaces too. However, to balance these qualities they have questionably ignored issues of environment and context. Emery recounted a somewhat bewildering phone conversation he had with Denton while he was walking the site he had just purchased. Denton was in his studio in Melbourne and asked Emery to describe what he could see. Not satisfied with the answer, he instructed him to walk further up the hill and once again describe the view. And thus the house site was selected. Other elements further illustrate this carelessness with context. The west-facing ribbon of glass, and large south-facing wall of glass in the Master Bedroom are deliberately static. There are no balconies beyond, the windows do not even open. The landscape is intended to be viewed, not experienced. The first sketch design presentation, another story recounted by Emery, involved a few rough lines on a creased piece of yellow trace. No site plan, no renders of house and context. This is the theory of high modernism at its most dogmatic. DCM are one of Melbourne’s and Australia’s most important architecture practices, with an oeuvre covering museums, embassies, hotels and urban parks. In their many decades of projects, they have however built only six houses. Denton said that the practice is not geared up to work on such small scale projects – they lose too much money. Despite our above criticisms, we nevertheless feel this is a pity. We are enamoured with a lot of their work, their smaller buildings in particular. They have a great eye for form and detail, and perhaps thanks to their preparedness to be selective with the issues they address, are excellent at reducing a building to its essential elements. DCM may have disengaged with the context of Emery House, but they have done so compellingly, with panache and a smile on their faces. Within the complex, multifaceted architectural community in Melbourne, surely there is room even for the makers of fine objects, architecture to be admired more than inhabited. We are very much looking forward to visiting Emery House in the upcoming Robin Boyd Foundation Open Day. We hope to be educated by its detail and perhaps discover a thing or two about the crafting of architectural jewels.